L.A. Youth writers review Lady Gaga, Death Cab for Cutie and Passion Pit. Brian, 15, is gaga for Glee, the hit show from Fox. Patricia, 18, thinks this remake is a perfect summer flick. All of her favorite toys are back in this animated film that made Justine, 16, laugh a lot. First-time theater goer Melissa, 16, loved everything about this World War II musical. These are letters we received about stories that appeared in the March – April 2010 issue of L.A. Youth. Essay contest: When are you an adult? Essay contest winners say they already are, the court will decide and they’re in no rush to grow up. Where do I stand on health care? With so much conflicting information out there, Kiera, 16, realized she had to do her own research to figure out what she thought of the health care reform. 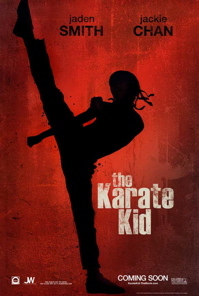 Kick off your summer by watching The Karate Kid. It’s the best action movie I’ve seen this year. With a lot of action and humor, you’ll want to see it over and over again. Twelve-year-old Dre Parker (Jaden Smith) and his mom, Sherry Parker (Taraji P. Henson), have just begun their new life in China after being transferred for her job. While in the neighborhood park, Dre meets a girl named Meiying and falls for her. Dre’s friendship with Meiying quickly angers a local boy named Cheng, who beats Dre up using kung-fu. Dre hides his bruised eye from his mom and starts school where Cheng also attends. Cheng and his friends bully Dre and demand that he stay away from Meiying and them as well. Wanting revenge, Dre throws a bucket of water at Cheng and his friends. They chase him home and beat him up again. Then the maintenance man, Mr. Han (Jackie Chan) shows up and uses his kung-fu to save Dre and to fight off the boys. In shock that Mr. Han defeated six boys alone, Dre asks him to teach him how to fight. Mr. Han refuses and instead goes to talk to Cheng’s karate teacher about how it’s wrong that his students use kung-fu to hurt people. Cheng’s teacher makes a deal with Mr. Han. If Dre can defeat Cheng in a karate tournament, he will ask Cheng to leave Dre alone. He accepts the deal and Mr. Han becomes Dre’s karate teacher. I like many of Jackie Chan’s action movies. His performance as a quiet karate teacher was fantastic. In all of his movies you just see him fighting, but in this movie he was passing on the torch. He was teaching other people. You can see his soft side. I recommend this movie to anyone in need of an action movie this summer.